This page is for information about Northwest control-line model racing and links to racing-oriented web sites. For information on control-line racing in the United States, see the special interest group National Control Line Racing Association web site. 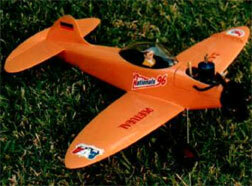 NCLRA is the racing special interest group recognized by the Academy of Model Aeronautics. The website includes digital issues of the excellent newsletter Torque Roll. Your District XI representative on the Academy of Model Aeronautics Racing Contest Board is John Thompson. For discussion of national racing matters, see the Delphi Racing Forum. B-Team racers are the glamour girls of control-line racing -- vintage airplanes dressed up in fancy paint as well as tuned for going fast. Here are several views of some contemporary B-Team racers. Dave Shrum photos.